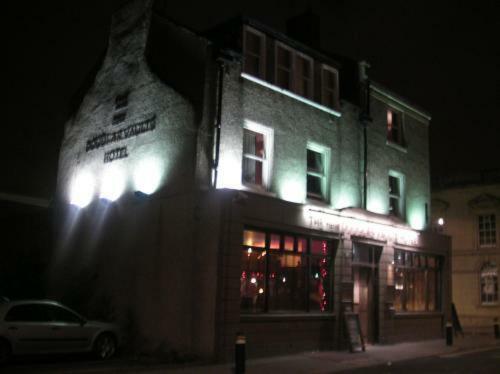 Overlooking the market square, right in the heart of South Shields'' town centre, the Douglas Vaults is a friendly traditional pub offering free Wi-Fi, and comfortable, great-value rooms. The Douglas Vaults is just metres from the town centre''s shops, bars and restaurants. South Shields'' 24-hour Asda supermarket is just a one-minute walk away and the parks and beaches are about 15 minutes away Clean and modern, the rooms are upstairs, above the pub. All rooms have washbasins, mirrors, tea/coffee, TVs and DVD players. En suite rooms and rooms with shared bathroom facilities are available. There is a shared shower room, which has a power shower, a toilet and a washbasin. All guests have 24-hour access to the fully equipped self-catering kitchen. The kitchen is stocked with a choice of cereals, bread, milk, fruit juice, butter, fresh fruit, tea, coffee and condiments. The pub downstairs offers a range of drinks, pub games and regular entertainment.